We’ve previously reviewed an Institute for Excellence in Writing (IEW) product, so we were all excited to try out their Fix It! 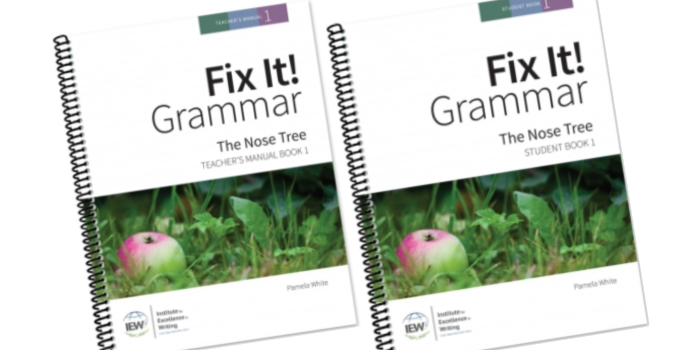 Grammar curriculum! This curriculum is appropriate for grades 3-12 through the use of the 6 books in the series. After taking the placement test, we started with the first book, The Nose Tree, and things are going very, very well! Before ordering, I had both of my children take the Fix It! Grammar placement test. 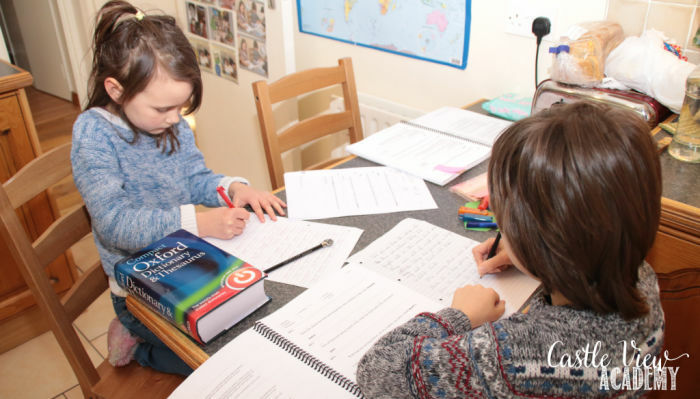 They knew a good portion of what they would learn in Book One, but hadn’t yet learned a few of the grammar items yet, so it was better to have them start from the beginning and feel confident rather than struggle by skipping over it. We received both the Teacher’s Manual and the Student Book for Fix IT! Grammar’s Level One, which is The Nose Tree. The Student Book has the lessons, vocabulary cards on card stock that can be cut out and used, as well as an extensive Glossary at the back that can be used not just for these lessons, but kept for grammar reference for the higher levels in addition to general use. The Teacher’s Manual has all the info you need to teach and correct your student’s work, and I especially appreciate the explanations given on irregular grammar usage. There is a Glossary at the back, and in addition, you will find a link to where you can download and print the Student’s Book. 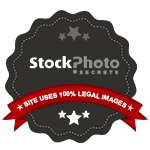 With this link, and checking their licence use, Tristan is able to use the printed book and Kallista is able to join in the classes with the downloaded version. I love when my children can take classes together! With the Teacher’s Manual, there are also links to video and audio webinars that are very informative and also a bit of a laugh to listen to! Andrew Pudewa spent time in Japan, as did I, and he learned about the difficulties of the English language while he was there. I giggled at him saying that English is hard because of the strange rules from many different languages included. I don’t know how many times I told students that I couldn’t explain why something was said in a particular way, “English is hard!” I often said. With this connection, as well as other information Pudewa shared, I felt more in sync and confident to use this grammar curriculum with my children even though grammar is not my strong point, especially when it comes to trying to explain it to someone else. 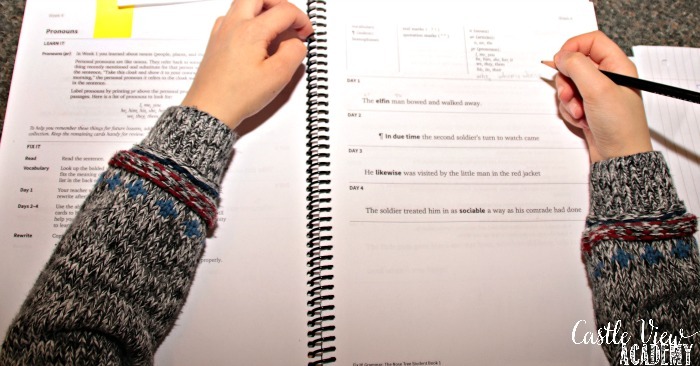 This grammar curriculum is set out to be used 4 days a week. 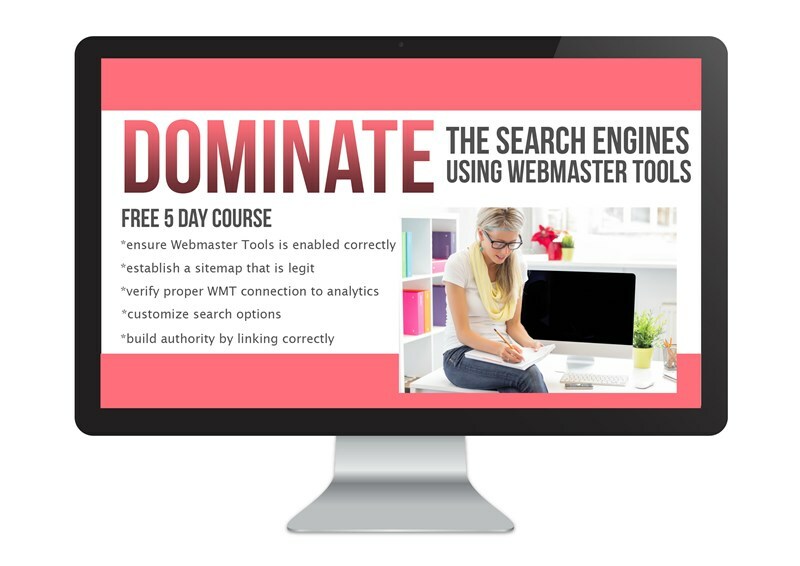 There’s one lesson a week, divided into four days, with each day taking about 15 minutes. For children who are already more confident in the lessons, you can double up on them. 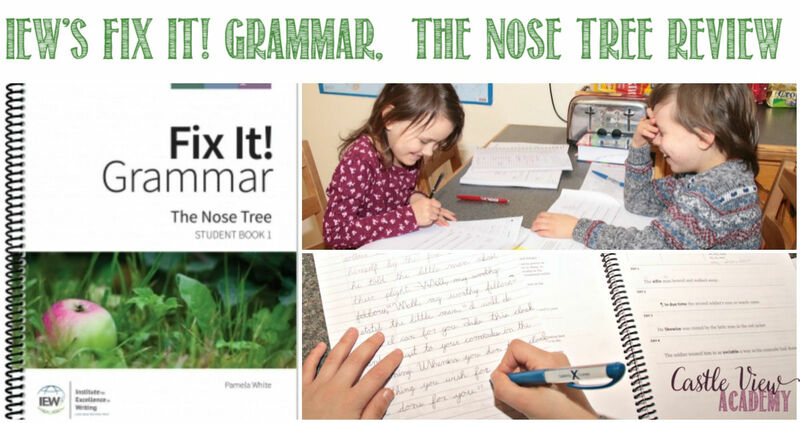 One beautiful way to schedule these lessons that I used, was that I purchased The Nose Tree lesson plans from Homeschool Planet to use with their calendar. This way all I had to do was set the days I wanted the kids to work on IEW, and say how long our school year is and the whole thing was scheduled out for me and loaded into the children’s calendars so they knew each day what they would be working on. Brilliant! My children are already very familiar with most of the grammar points introduced in the first two-thirds of this book, so they’ve been working at an accelerated pace, 5 days a week, with their goal being to complete the book before we fly home for a visit. Then they can come back and start fresh with the second book in the series. We are being a little naughty with this and at the moment completing about 3-4 lessons a day in one or two sittings. Kallista (8) is so keen to move ahead she’s even marking parts of speech she knows but haven’t yet been covered in the book. When more new material is introduced, we will certainly slow the pace down, but right now it is mostly review, which is okay with me. 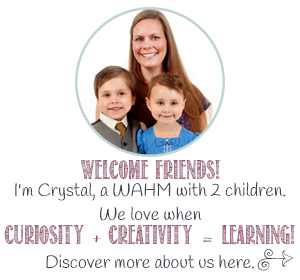 On day one, I sit with the children and introduce any concepts being introduced. Then we all work together on labelling the parts of speech in the daily sentence. There’s also a vocabulary word to look up in the dictionary and write down. Then the children copy the passage into a notebook. 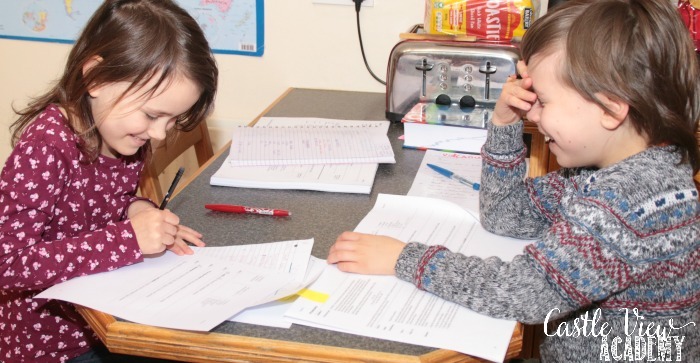 On days two to four, the children look up the vocabulary and write down the definitions, then label the parts of speech and make any corrections to each daily sentence. Then we sit together and go through each sentence and vocab word. At this point, I can use the explanations in the Teacher’s Manual to explain why something is or is not what they expect. That’s where we all generally learn something new. And we discover that different programs and teachers may mark the same passage differently, yet all can be correct, which is just one of the reasons it’s so difficult to teach and to learn this language we speak. Finally, the children write the sentences into their notebooks. When they reach lesson 33, they will have the entire Nose Tree story written out in their own handwriting, which will be fun for them to go back to and read in full. It will also be interesting to see how their penmanship improves over that time period, too. There are many things that we like about this grammar curriculum. We like that it doesn’t take a lot of time each day and that each concept is presented clearly and builds upon previous ones. There is additional information given about advanced topics to help explain current concepts when needed, which makes this book easy to use for both of my children who know different levels of grammar. 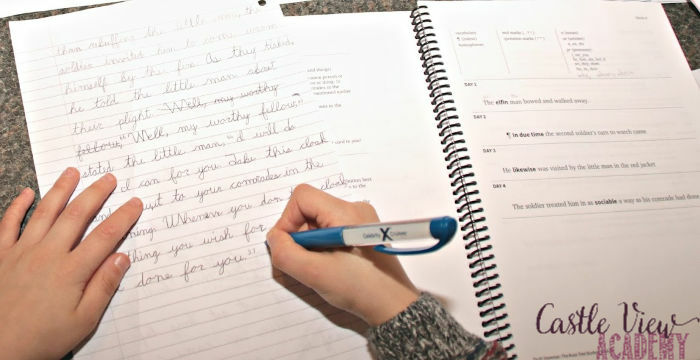 Because students learn by fixing up already written text, they don’t feel so threatened by having errors with their own work, and it’s easier to spot errors in another’s composition than your own. The webinars are useful and help remind me that ‘correct’ grammar can take many forms, depending upon which style guide you use, which languages are involved (English has words originating from many languages), as well as to not be too serious and have some fun while learning. I like the dress ups that are encouraged; things such as finding the strongest verb or quality adjectives in a paragraph and noting how it’s the most descriptive. Little things like this encourage imagination and better writing. It’s fun when Kallista will tell me in general conversation that I’ve just used a strong verb. Tristan is strangely happy that he can look up the daily vocabulary in the dictionary he requested for Christmas. He’s also very happy that he’s learning how to divide text into paragraphs, as this is something he endeavoured to learn this year. Absolutely! The children are enjoying the lessons, and we’re all learning from them. The Teacher’s Manuals are very reasonably priced, too, and we’re already planning to move up to the second book in the autumn. I find Fix It! Grammar easy to teach, and the children are learning; you can’t do better than that. 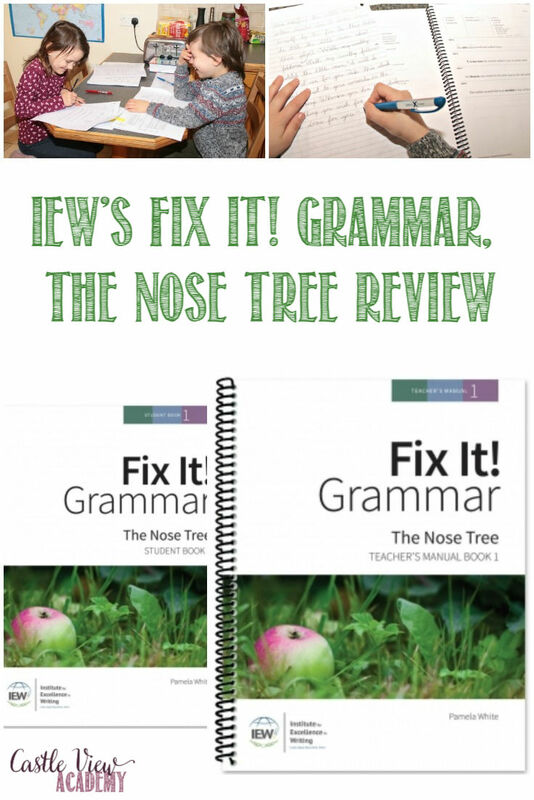 To read 60 more honest reviews about Institute for Excellence in Writing (IEW) by the Homeschool Review Crew, for The Nose Tree, as well as the other 5 levels in this series click here. 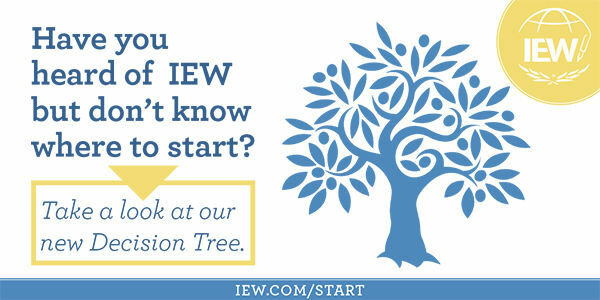 If you’d like to know more or would like to follow IEW, you can connect with them through their website, Facebook, Twitter, Pinterest, YouTube, and Instagram.